Eve Online developers CCP have been fighting an invisible war against bots since the game launched in 2003. Yesterday they changed their tactics, announcing new punishments for players caught botting, but their new target isn’t the bot problem – it is the perception of the bot problem. Bots are entities that automate repetitive tasks, including resource farming and making trade deals. They are not unique to Eve Online as they have, in fact, been around for almost as long as MMOs. 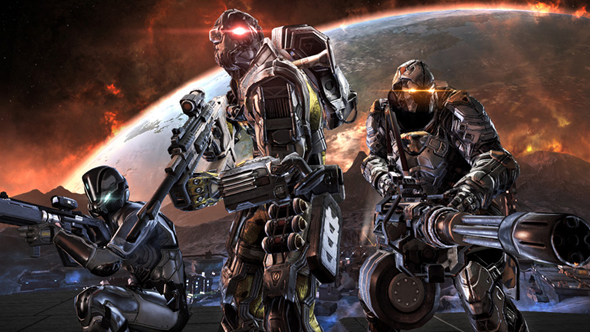 In the hands of Eve players, bots can be used to gain an economic edge, harvesting resources to sell in-game to fund their corporation’s wars. “Really, any sort of gathering of resources groups of normal players could do with hard work,” CCP Guard explains to me. Bots are also an essential tool for real money traders (RMTs); players who stockpile resources and sell them for real cash in trades made outside of the game.You may know RMTs by a particular sub-species: the gold farmer. 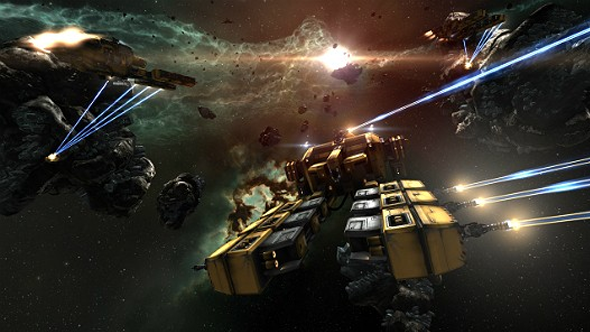 Gold farming used to be a significant problem in Eve Online as it created a black market where players could buy large quantities of ISK, the in-game currency, skipping out the grind that is otherwise necessary to acquire cash. In 2008, CCP led the fight against RMTs by cutting out the market underneath gold farmers with PLEX, an official way for players to buy in-game currency. Those with little time to farm resources for themselves could buy a unit of PLEX (which could be converted into game time in lieu of a subscription) and trade it in-game for ISK. CCP had found a way for players to essentially buy in-game currency without destabilising the economy. PLEX had a dramatic effect on the presence of gold farmers: as they no longer provided a service that CCP didn’t, players ignored gold farmers and bought PLEX instead. “We need to make it uneconomical for their business in Eve,” CCP Guard says when explaining the company’s approach to RMTs. A number of other MMOs have followed CCP’s lead, adding their own ways for players to buy in-game cash. However, in 2016, CCP made a change that opened the doors to botters again: they made the game free-to-play. 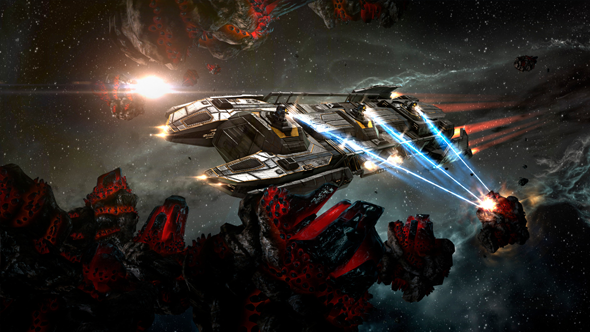 Previously, Eve players needed a subscription to play longer than the 14-day trial period. But the move to free-to-play meant they could play for as long as they wanted – albeit with a character that had limitations on which skills they could train. That’s not the only problem open access introduced. Anyone could sign up for Eve’s 14-day trial since the game launched back in 2003. All the inactive accounts that has created are still in the game. Now, with the launch of open access, if someone has the login details for one of those accounts they can start playing as a free-to-play player. Due to large-scale data breaches at places like LinkedIn and Adobe, there are billions of email addresses and passwords up for sale on the darker parts of the internet. Using a process called ‘credential stuffing’, someone can buy a bundle of data and automate the process of attempting to log into Eve with each of those email addresses. If any of those addresses were once used to create an account in Eve, and the person who made the account used the same password for Eve as they did for the service where their data was stolen from, then the nefarious party can now access a completely legitimate free-to-play account. “Free-to-play is inherently right for a game like Eve Online, having more people in the sandbox is what it’s all about, but at the same time it doesn’t work if bots are all over it,” CCP Grimmi adds. The damage the bots do is not to the game’s economy, it is their visibility and the perception that CCP isn’t doing anything about them that causes hurt. The developers know there will always be some bots to combat – “No game has ever completely gotten rid of this problem,” CCP Guard says. “We think of it more like a war of attrition.” Even so, CCP need to convey that they /are/ fighting them and that players who report bots are helping to clear the game of RMTs. CCP have streamlined the process of reporting accounts you might suspect are bots or involved in botting. If CCP confirm that the account is guilty the targeted player receives a ban. If it is their first offense then the ban is just three days – essentially a slap on the wrist to let the player know the activity is wrong. If that player is caught a second time then they are permanently banned from the game. “When we remove people from the game permanently, everything they have is gone and we will go in and, if it is a bot haven, we will blow up their infrastructure just to make sure there is nothing in the game,” CCP Peligro says. The shift in approach is clear in the way that CCP measure their success. “We’ve been measuring bans for the longest time and we’re not so sure [success there] has any impact, so now we’re trying to measure player sentiment as the true indicator of whether or not we’re doing a good job,” CCP Peligro says. 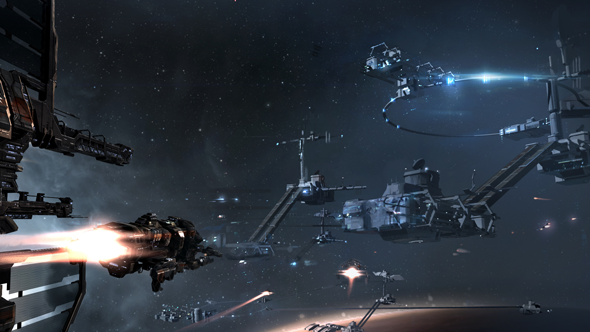 For months, Eve’s players have called on CCP to rid the game of bots. 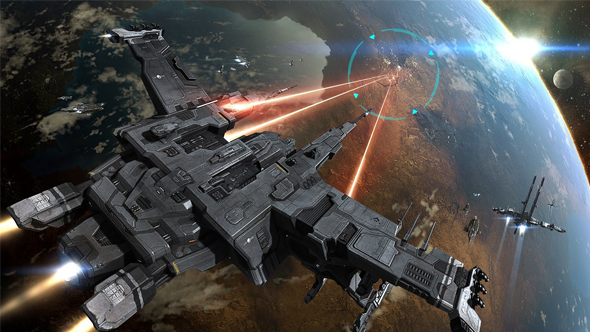 With their announcements yesterday, CCP have turned the tables, recruiting players into the war that Eve’s developers have been fighting for the past 15 years. It shouldn’t be a surprise that for a game which so frequently straddles the real world and the digital, that the footsoldiers in this war against a digital enemy will be made up of human players.